Blog We Sold Our Tiny House! You Must be wondering, What on earth were we thinking? When I built the tiny house I never imagined in a short period of time placing it for sale at that time I was dating a lovely woman Ciarra who is now my wife. At that time I designed the tiny house with my needs in mind and maybe the possibility of someone else living there too eventually. 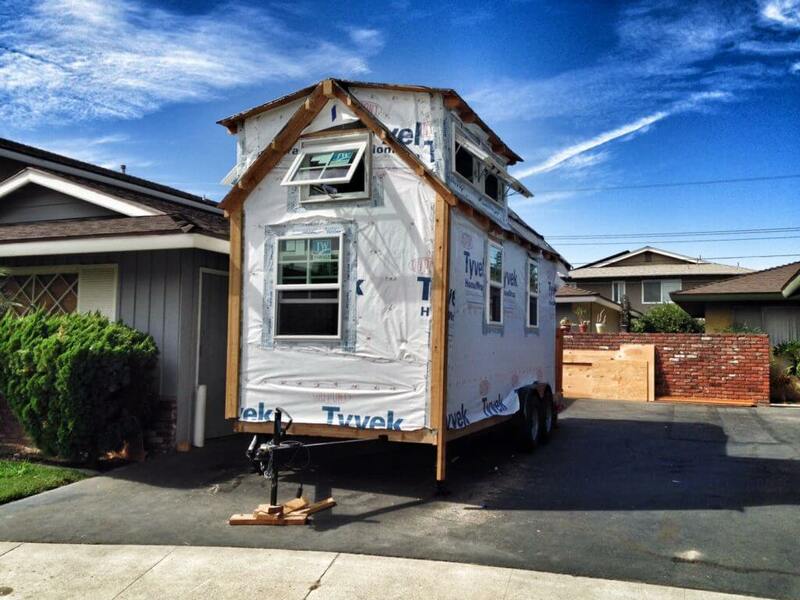 Back in 2013 there was only a few companies providing trailers designed for a 10k pound Tiny house to be built on top of it so my choices in trailer width and length were not many. 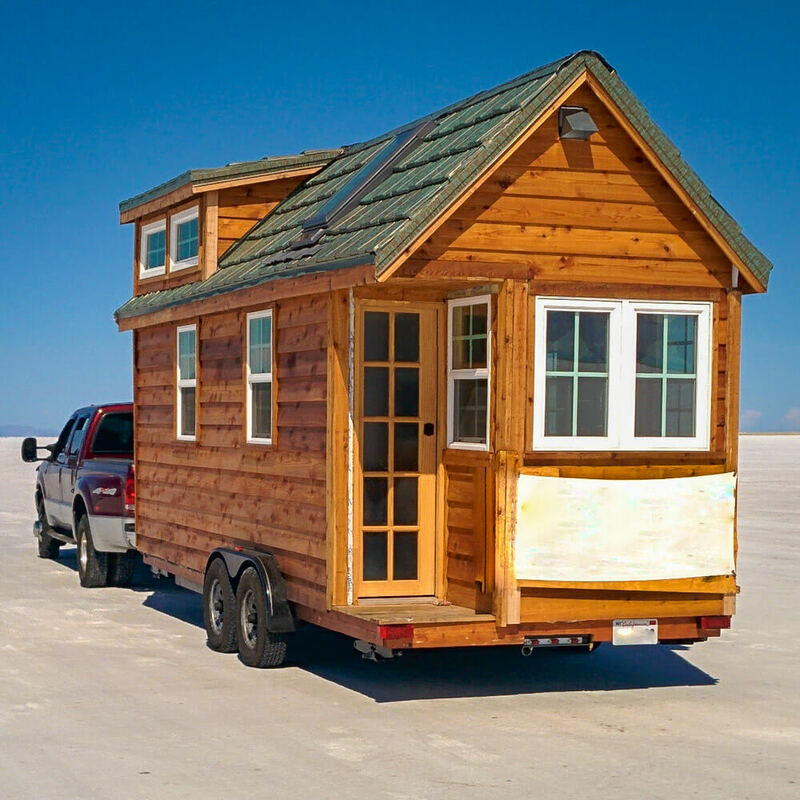 I based my design on a more narrow Tumbleweed tiny house. They provided detailed blue prints and material list along with over the phone support for those questions that would come up during the build, This helped me as I have never built anything in my life. The architectural detail of Dormers were now becoming a thing with tiny houses for that extra bit of room as they resembled craftsmen style homes. Others online were barely starting to post about there builds and everyone’s looked about the same except for the standout build from Tiny House Basics and their “Entertaining Abode” They seemed to just want to be a rebel and had built a much larger tiny house that my 20ft version. During the build Ciarra would help out when she could as she knew this can one day be her tiny house as well if I played my cards right. As for the interior layout, There wasn’t to much room for customizing as I was following the plans I purchased as it made me feel more secure in following the plans exactly. Upon completing the tiny house and further upgrading it with all my high tech goodies. I set off on 28k miles of adventure through the west coast of the US. Living in the tiny house by myself was amazing and I loved every minute of it, I didn’t need anything more. I had a gourmet kitchen, A big closet that rolled in and out of my shower, Full bathroom, two big TV screens, a lot of wireless technology like remote activated lights, I had an amazing and efficient Mini-split a/c system, a bedroom in the loft with dormers for extra room. I even had a solar system that was powered by salt water batteries. I could drive anywhere and be home at the same time. As time when on, I realized that although I was in a different location all the time, my heart was still in las Vegas with Ciarra. Love for my girlfriend grew to where I didn’t like traveling alone and being so far away. I wanted her by my side to enjoy these adventures with me. I knew in the near future when we got married we would move in together so I decided to move to Las Vegas and I asked Ciarra to be my wife. 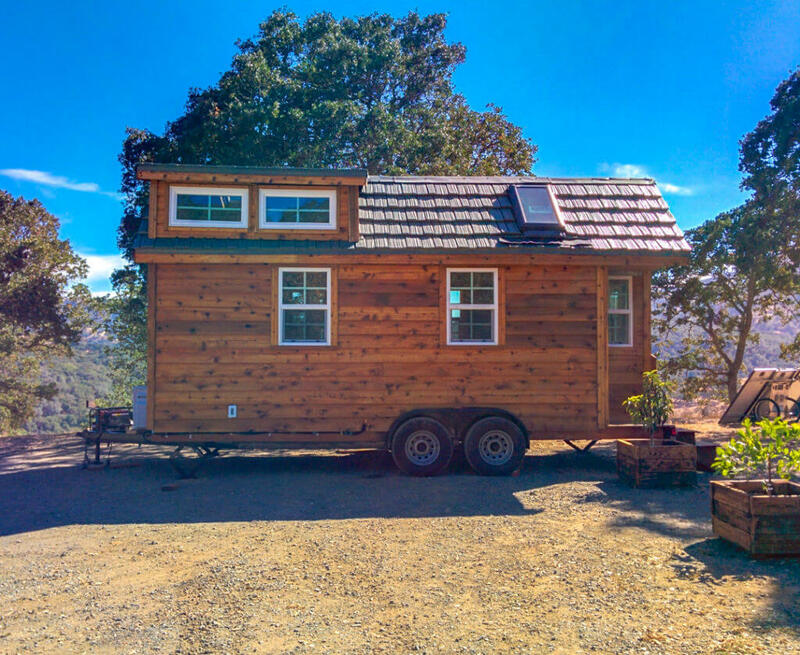 As for Ciarra she had been living in an 800 square foot guest house for over a year, asking her to move into a tiny house of less than 200 sq ft was a little nerve wrecking. For myself, I had one year and 2 months to mentally prepare for this big change in the decrease of square footage but she had just three months to mentally prepare. After living in our tiny house for a year we had such a good rhythm that our first year of marriage was starting off on the right foot. As time went on we started to realize that my wants in building and designing this tiny House were exactly that, mine and not hers. How could she have known what she wanted if she had never spent the time to think about it or even live in a small space? Our first year really helped both of us think and meditate on what we both wanted as a married couple instead of what I wanted as a unmarried man when I designed and built this tiny house. We soon would share comments like: “I wish we had this” or “I wish this was this way” and these would expand overtime. These comments turned into us writing down a list of things we wanted different from what we currently had so we can plan a make over. 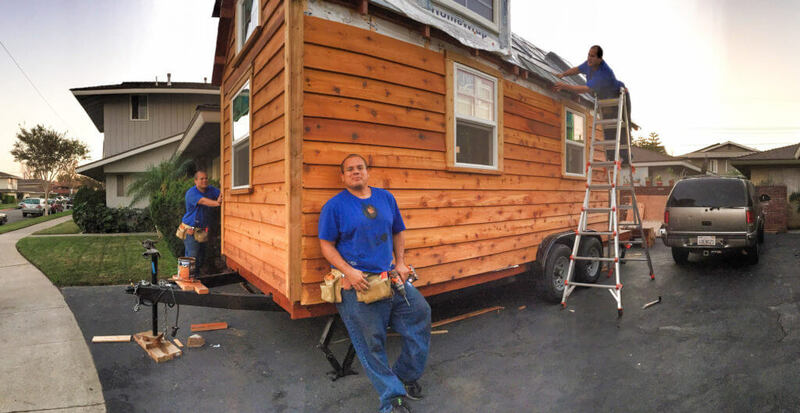 This list then turned into the idea of building another tiny house together from the ground up. 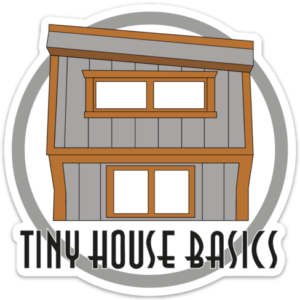 If you have personally built a tiny house, you well know it’s no small project but we gave it a lot of thought and weighed the pros and cons when we then came to the conclusion to build a new tiny house. Once we reached that decision we planned our budget accordingly to be a project that would take two years of saving and living paycheck to paycheck while building. First of on our list was the bedroom, That had to be bigger and wider since our first tiny house trailer was only 7.5 feet wide and our bedroom needed a ladder to get to. We decided the ladder needed to go. We did love how it felt to be laying down in our bed looking out of the skylight at night but we did want a little more room instead of me crawling over my wife when I had to go down ladder. Both my wife and I have bad knees so we realized in 10-15 years it might get harder for us to climb a ladder, so in a effort to future proof our design we wanted to do stairs. 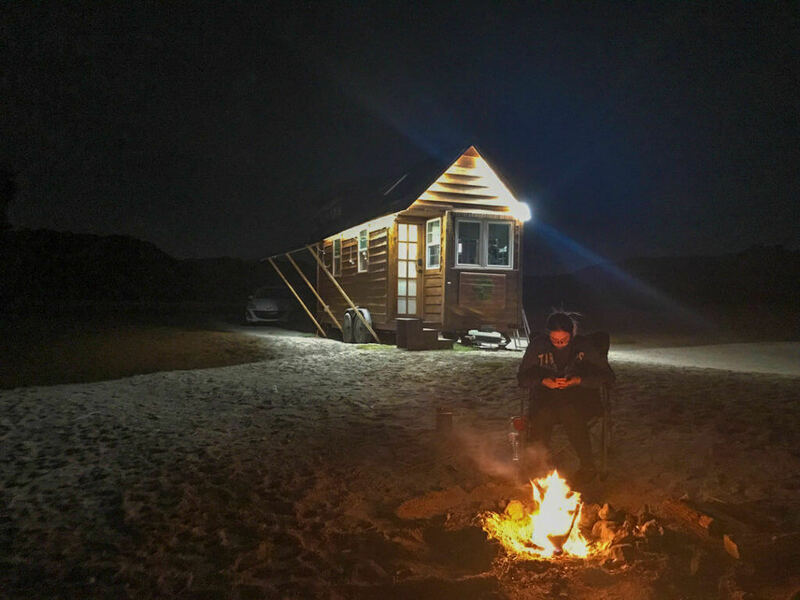 This is one of the main reasons we decided to do a gooseneck tiny house trailer, We could get a bedroom that we can walk around in and actually stand up in along with a nice sized closet and a big sky light above our heads to look out at night and enjoy the stars. Second big change was no more rolling cabinet into the shower. We both wanted a sink and more space in our restroom and maybe even a tub. The solution was a restroom that was three times the size of our first tiny house with a sink, bath tub and laundry room all in one. Third on our list was to have more counter space in the kitchen. We loved the design of the first tiny house kitchen and all of the gourmet appliances, but wanted more space and a full size fridge. Our kitchen now is twice the size and has vaulted ceiling and no loft above it. We also decided on a more modern style shed roof like the Entertaining abode as well as a 6ft Accordion window, we stole Tiny House Basics idea shhhh don’t say anything! In designing a bigger kitchen, we also have more under counter storage and were able to fit a 24 inch propane range. Next up was our the living room. We decided not to change much as we thought our living room area was perfect, it has big screen tv and a Mini-Split A/C system close by so we kept that design the same but get an extra foot and a half of room in width because our Tiny House Basics’ Gooseneck trailer has a 8.5 feet wide Deck. We still loved our loft bedroom in our first tiny house and loved watching movies up there as it is so very cozy, so we decided to build another 11 foot loft above the living room area with a bigger skylight than the first tiny house and with the shed style roof it would give us more headroom space inside. In this whole planning process we never planned to sell our tiny house right away, but thats the thing with plans, they can change. It ended up selling quicker than we thought and turned our 2 yr build schedule into only three months. move in by early oct 2018. 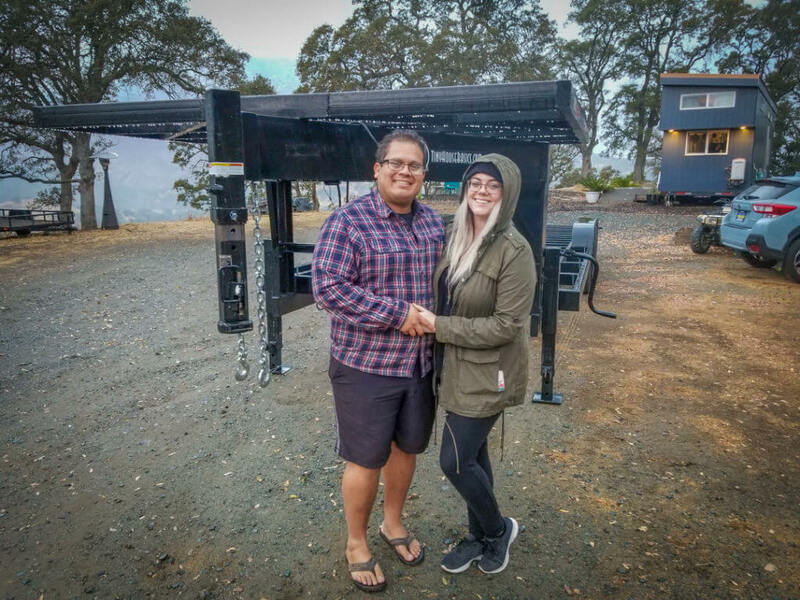 We are very grateful for the Amazing trailer we purchased from www.tinyhousebasics.com and for all our partners from our first tiny house who helped with our second tiny house. These are some of the reasons why we decided to keep the tiny house lifestyle. We fell in love with it and couldn’t see ourselves living any other way. 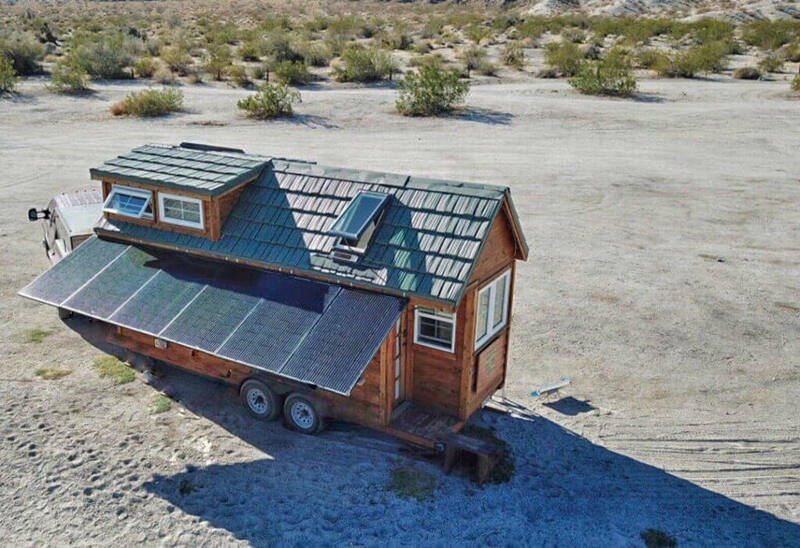 Even though we spent 35k on our first tiny house we actually saved so much more by not having to pay rent in Southern California and even though our second tiny house will cost more then 35k we will still save more money and have more freedom than living any other way.